I finally received the recipe from my Mexican physicist friend, Fernando. It seems that this dish is popular in Mexico. According to my Mexican friends, Tinga means disorder which refers to a tasty shredded meat, usually as a filling for tacos. It tasted so good that I wanted to share this recipe. 1. In a medium-sized pot, put chicken, large cube onions and smashed garlics. Add water to cover. Add 1 tsp salt and bring to a boil over high heat. Skim off the foam on surface. Reduce to medium-low heat and let it simmer, uncovered, until chicken is opaque throughout. About 20-30 mins. 2. Meanwhile, using a blender, blend chipotles and tomatoes. 3. Transfer chicken to plate. Reserve broth if needed. 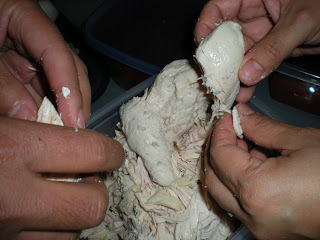 When chicken is cool enough to handle, remove fat and coarsely shred with fingers. 4. In a large skillet, heat oil over medium heat. Add garlic and onion and cook until transparent. 5. 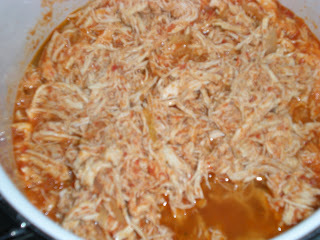 Add tomato mixture, chicken broth powder and shredded onto skillet. Cook for 10-15 minutes. If it is dry, add liquid chicken broth but do not add too much. You don't want it to be runny. 6. Serve with rice or tacos. I also heard about it from a friend of mine who was saying that it is very delicious and tasty recipe. We tried making it at home but couldn't get the desired taste.